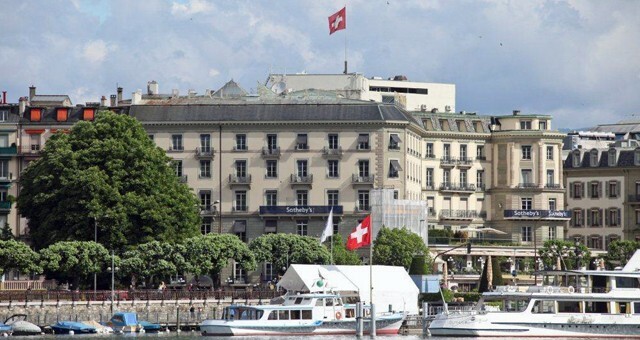 Every time I visit Geneva, I always feel that it is my second home away from home, following Hong Kong. The tranquility is felt in the air, and people are just relaxed, no tension, no worries. In terms of the auction; by the end of the evening, Sotheby’s sold a total of over $175 million worth of Magnificent Jewels. It is already starting to sound like Geneva will break sales records. Out of the ten top lots sold, 8 were Fancy Color Diamonds. Together, these 8 items accounted for over 52% of the sale in value ($91 million), while they accounted for only 1.6% of items, out of 493 (2 were removed). It shows the concentration of wealth at auction as well. The last item sold at the auction that the whole world was waiting for is the top selling Lot of the evening; “The Unique Pink” Diamond. The opening bid was $24.55 million and within 4 minutes it ended up selling for a total of $31,561,200 to be exact, or $2.052 million per carat. 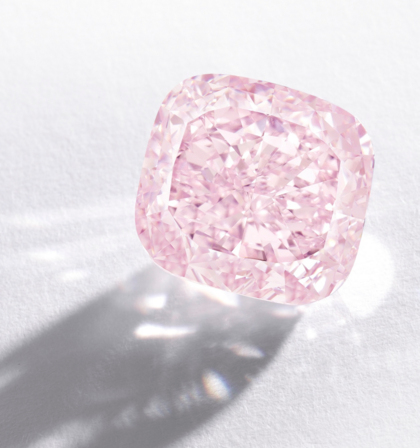 It is now the new world record holder for the total price paid for a Fancy Vivid Pink at auction as well as the current world record per carat for a Fancy Vivid Pink above 10 carats. The previous world record was for the 16.08 carat Vivid Pink which was sold back in November of 2015 in Geneva that was sold for $28.687 million total or $1.784 million per carat. The world record per carat for any pink diamond is still held by the 5.00 carat Fancy Vivid Pink that was sold in Hong Kong back in 2009, and that is $2.155 million per carat. 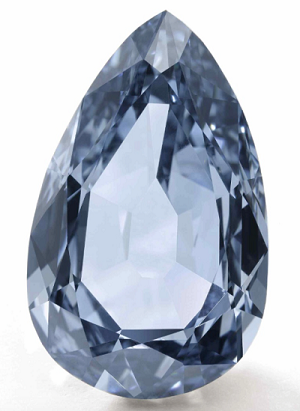 The second top lot to be sold was the 7.32 carat, Fancy Vivid Blue diamond with IF clarity. It ended up selling for a total of $17.11 million or $2.338 million per carat. It has broken no record, but it is a significant testament to the value of important diamonds. In the 5-10 carat, Fancy Vivid Blue category, it is now in second place in terms of total price and per carat price paid. The record holder for that category is the famous 9.75 carat pear shape sold in New York back in 2014 for $32.645 million total or $3.348 million per carat. 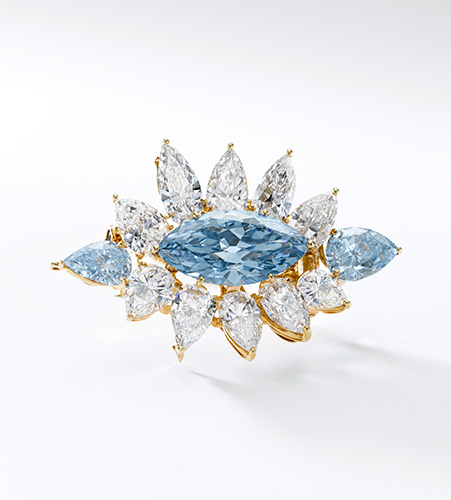 The third highest item sold was the 6.64 carat Fancy Intense Blue diamond from Alexandre Reza. 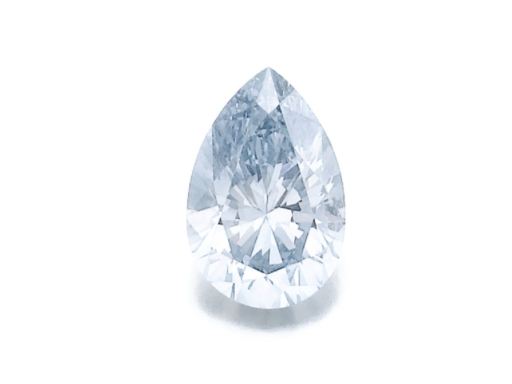 Although it has two more blue diamonds, and it is difficult to sperate the value between the larger more significant Intense blue to the 2 smaller ones, we will account 70% of value to the 6.64 carat, and 20% to the 2.01 and 10% to 1.01 carat. The total price paid was $13,672,493. 70% makes $9,570,745.1 or $1.441 million per carat; a record price. For the 2.01 carat at 20% makes it valued at $2,734.5 million or $1.36 million per carat, another record. Finally, for the 1.01 carat at 10%, the value is $1,367,249.30 or $1.353 million per carat, a third record. 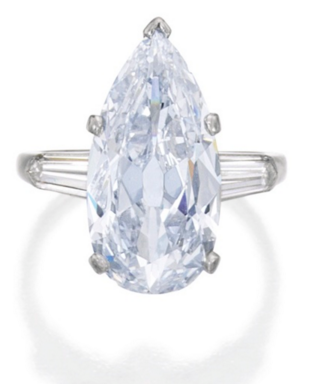 Overall this piece has sold for a record average of $1.415 million per carat. Previous record for the 1-3 carat group was the 1.74 carat round brilliant Fancy Intense Blue at $1.106 million per carat. 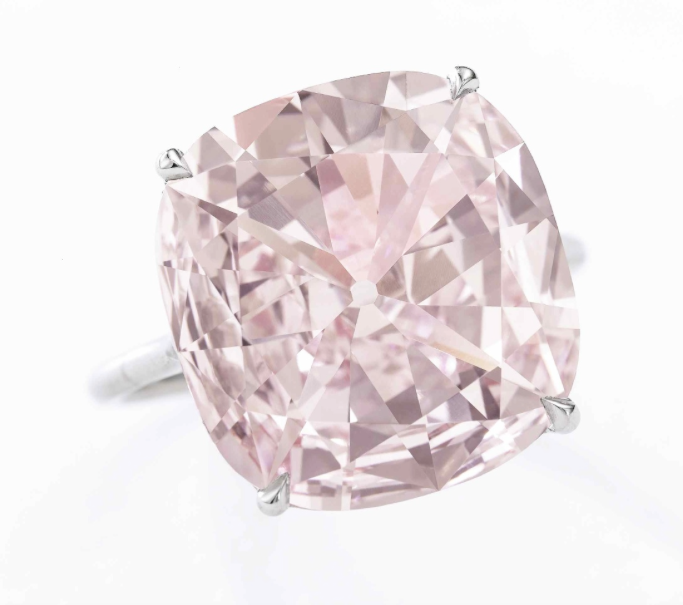 The fourth highest sold item was the 18.51 carat Fancy Pink, modified pear shape with VVS1 clarity with potential IF. 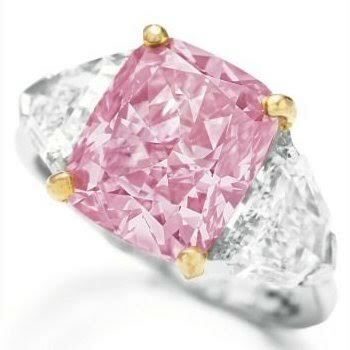 It was sold for a total of $9,773,672 or $528k per carat. 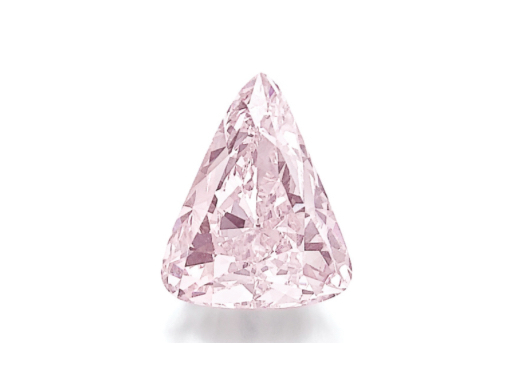 Currently it is the record holder for any Fancy Pink diamond total price as well as the highest per carat price paid for a Fancy Pink. 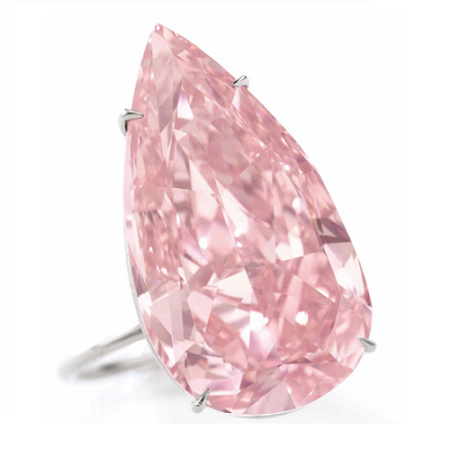 The last record per carat holder was the 12.45 pink diamond sold on April 19, 2016 in Sotheby’s New York which was valued at $366k per carat. 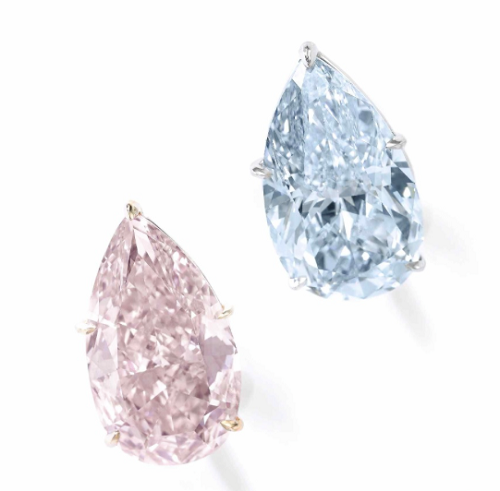 The only pair that was sold in Fancy Color Diamonds was the 8.85 carat Fancy Blue, VS2 clarity with the 8.79 carat Fancy orange Pink with VVS2 clarity Diamond. It was sold for a total $5,989,523. in terms of assessing the value to each, we have to look at potential and that is how the buyer will look at it, and value it. The Fancy orangy pink will most likely be re-polished into a Fancy Pink, which will upgrade it in terms of value. The carat loss can be assessed at around 5-6%, which will put the new weight at around 8.30 carats. Even if it ends up at 8 carats, it is still worth it. The value split between the Fancy Blue and Fancy Pink would be 55% blue and 45% pink due to rarity of blue vs. pink. This puts the value of the Fancy Blue at a total of $3,294,237.65 or $372,230 per carat and the pink at $2,695,285.35 or $306,630.87 per carat. In both cases these are not records, but a significant sign that prices are holding strong compared to colourless diamonds. In the case of the next highest paid item, the value attributed to the diamond was based on color. 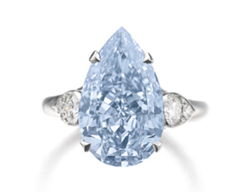 As the color, though determined by the GIA to be a Fancy Intense Blue, but the color was weak, hence the total price paid was $5,760,180 or $955,253 per carat. The other reason it garnered such a price was due to size. At 6.03 carats, it is still a rare size diamond to find with this intensity. Back in November 2013, a 5.51 carat Fancy Intense blue also sold for $985k per carat. This price level demonstrates that although a certificate says one thing, the value can be different. The color described within a GIA certificate for a Fancy Color Diamond is a range, and not an exact color. An expert can determine the strength of color. 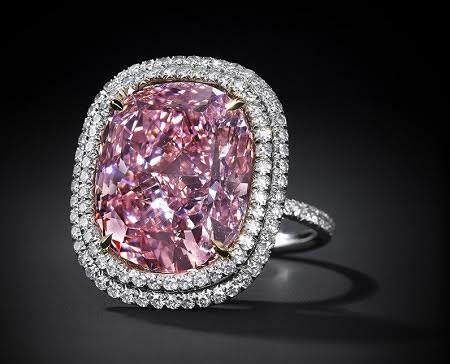 The 8.20 carat Fancy Purplish Pink ring sold for $3,696,098 or $450,743 per carat. The price paid signifies that the buyer will most likely re-polish the diamond and get to be certified a Fancy Pink, and at the same time, make it an Internally Flawless, from its current VVS1 clarity. This is an excellent investment. The 14.18 carat Fancy Blue with a VVS2 clarity was sold for a total of $3,696,098 or $260,655 per carat. 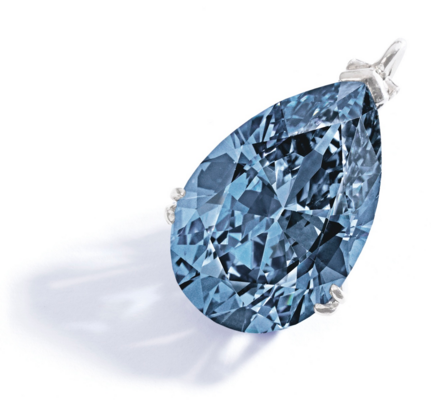 Why is it that the price was so low for such a size Fancy Blue diamond? we come back to the reason mentioned above. The color determines value, not the certificate. This fancy blue had a “washed out” blue, a very weak, border line Fancy Light Blue color. 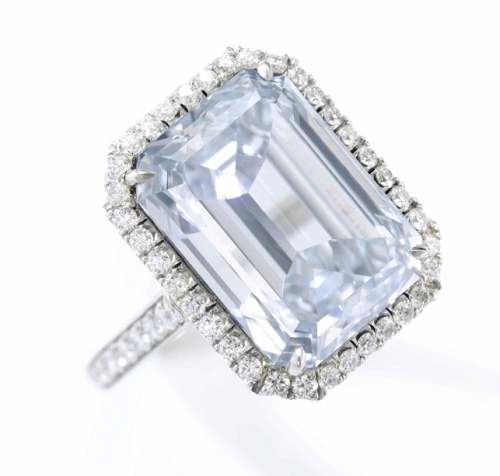 If i look back at my records, a 5.06 carat Fancy Light Blue diamond was sold back in april 2016 in a New York Sotheby’s auction for $286k per carat. The Lone orange, the 2.09 carat, Fancy Vivid Orange with a VVS2 clarity was sold for a total of $1,484,583 or $710,326 per carat. 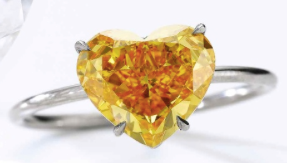 This is quite a strong price for such a diamond color and fell within the value range, but then again, we do not see many Fancy Vivid Orange diamonds at auctions. A few items went unsold, but that is normal, as we know that investors are looking for top quality goods for good value, and potential increase. They continue to consult with us, while taking into account current market conditions and overall global instability. Stay tuned for the results of the Christie’s Auction tonight.